What kind of bullets are you using? the holes are perfectly round without any edge tearing as if punched out with a die. Rig looks great Smokeeter. Too bad about the 4200 but honestly the 4-16 4500 works so well on these rigs. It looks like it will settle in nicely. Another deer whacker! 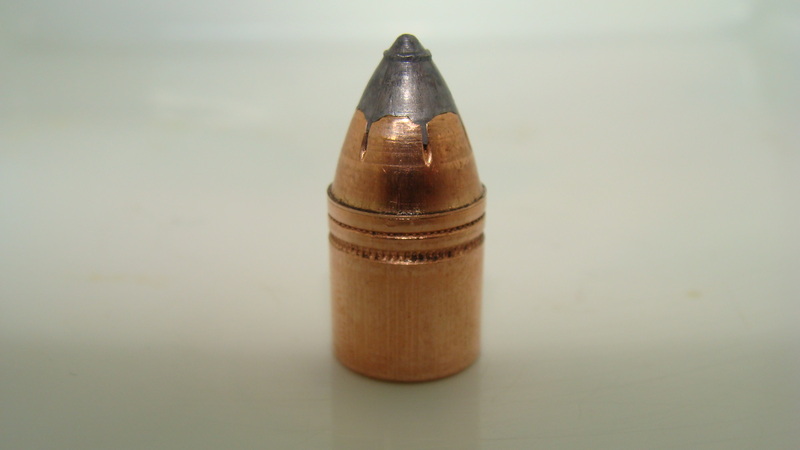 These are my modified XTP bullets the dies that reform them leave a ridge on the ogive and that ridge cuts a perfect round hole in the target. I snapped a pic of the 209 primer before and after the headspace was corrected ,it corrected both the bulging of the primer and the sticky removal from the breechplug. Both of these are from the same load which I know to be safe and not excessive. Bulging or deformed primers are an indication of high pressures but that is usually when deformed in a properly headspaced application. Is that a crack at the base of those primers or an optical illusion? I wondered about that myself, but didn't want to sound off by asking that question, glad you did , now I don;t feel so bad. no crack it's soot, the primer pocket has a sharp edge on the mouth and scrapes the primer when seated. That makes sense as the 209 looks perfectly formed from firing! Jaycee - eyes looking for potential problems are always welcome! 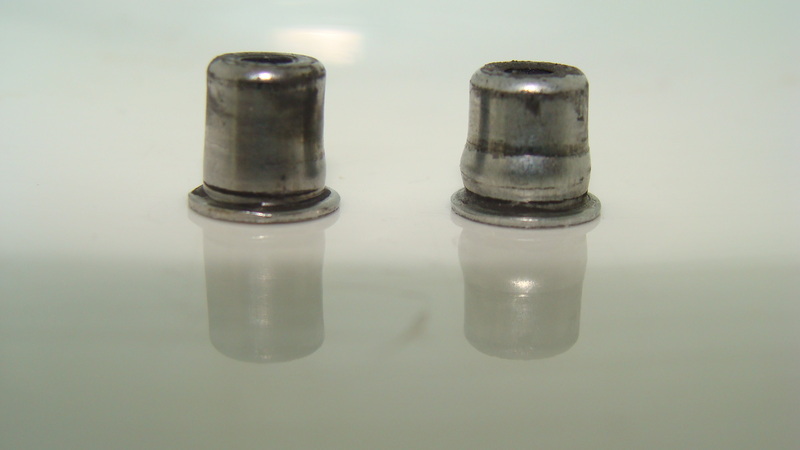 Looking at the picture of the primers, the one on the left still does not look right, the right side looks concaved and can readily be seen in the reflection of it below. It’s pretty typical because the primer only inserts part way into plug. All my stock savages did that. The other thing that affects the primer is the size of carbide bushing flash hole. Some guys use 30 and some use 40 thou. I’ve seen that same primer deformity consistently from light to heavy load. Incidentally when the carbide bushings start to open up and trumpet, increased pressure occurs against the 209 and the Center part of it will flatten similarly to a rifle primer flattening. Then you know it’s time to change the bushing!